Tuition.io to Power Student Loan Repayment Benefit for Estée Lauder Employees. Meniga to Support Digital Transformation for French Banking Group, BPCE. See Meniga at FinovateEurope 2018 in March. Handle Financial’s Prism Mobile App Reaches $1 Billion in Bills Paid. Finect Raises Capital as BME Takes Minority Stake. Actiance forges partnership with Relativity to bring seamless data delivery to eDiscovery platform. Neustar unveils multi-factor authentication risk assessment tool to help enterprises mitigate fraud risk. Tinkoff Bank and AHML to launch joint venture to offer mortgage loans via new electronic platform. Y Combinator interviews Jake Rosenberg, cofounder and CTO of LendUp. VentureBeat highlights OurCrowd, which has raised $650 million for 145 startups and plans to top $1 billion in 2018. Optimal Payments announces partnership with Oink. Braintree releases v.zero SDK, featuring support for Pay with PayPal. Bank Innovation highlights leaders at Ripple, LoopPay, Finect, and Fiserv in its list of 30 key innovators in fintech. Segmint named a Preferred Vendor of MAGNET Global Network. Holvi preps to launch into Irish marketplace. doxo named one of Washington State’s 100 Best Companies to Work For 2014 by Seattle Business magazine. Think Advisor features the different approaches of 3 robo-advisors: Betterment, Personal Capital, and Wealthfront. Cachet Financial Solutions prices Initial Public Offering. DoubleBeam’s GoPago POS system is enabling Slyde, a mobile commerce beacon-enabled shopping app. It is hard to believe that it is almost time for FinovateSpring 2014. There’s still plenty of time for you to get your tickets to our upcoming event in San Jose, California on April 29 and 30. Our final Sneak Peek preview post is up, all the companies who were prepping under the radar are now out of stealth, and we can’t wait for you to see what this year’s spring crop of fintech entrepreneurs and innovators has in store. We’ve grouped the achievements into four categories: Exits, Fundings, Awards, and Acquisitions. Enjoy! Arxan Technologies wins in the Products and Services Excellence category of the Infosecurity Global Excellence Awards. Banno CEO Wade Arnold wins CEO of the Year Award from Technology Association of Iowa. Better ATM Services wins 2013 Paybefore Award for Visa prepaid gift card program. EyeVerify wins first place at International Startup Competition. Finect provides winning entry for Web Marketing Association’s WebAward 2013. IntelliReponse wins bronze in Best in Biz Awards’ Most Innovative Product of the Year category for 2013. IntelliResponse wins 2013 CRM Excellence Award from CUSTOMER magazine. Kofax Mobile Capture platform wins “Elegant Implementation” category of Housing-Wire magazine’s HW TECH 100. LICUOS wins Innotribe Startup Disrupt competition at Next Bank Madrid. MoneyDesktop marketing video wins 2013 Telly Award. Keith Kelly, Mortgage Harmony CEO, awarded a Tech All-Star Award by Mortgage Banking Magazine. list of the World’s 50 Most Innovative Companies. OneID wins 2013 North America Frost & Sullivan Award for New Product Innovation. Virtual Piggy (Oink) receives Frost & Sullivan Excellence in Best Practices Award. Yseop Artificial Intelligence Software honored as French National Champion for European Business Awards. P2BInvestor raises $1.2 million in Series A round. Toopher wins spot among finalists for IBM SmartCamp North America Regional competition. MasterCard partners with Entrepreneurial Finance Lab (EFL) to promote small businesses in developing nations. Eli Lilly FCU selects Q2 for implementation of Unified User Experience. Boost Mobile Wallet powered by Wipit now offers Quick Check RDC service. BankersLab adds 4 senior financial services executives to its training team. Rubatino Refuse Removal joins doxo, its paperless adoption jumps 10% in first 90 days. 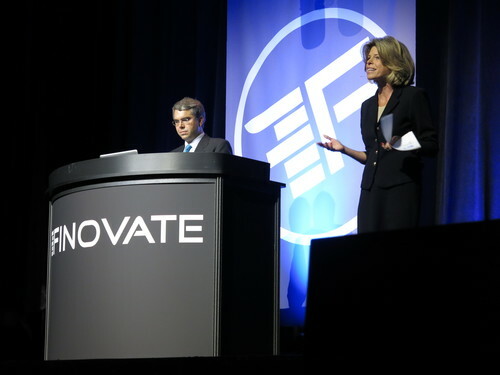 This post is part of our live coverage of FinovateFall 2013. The full demo video will be available in mid-September. Kofax announces completion of Kapow Technologies acquisition. ACI Worldwide cites role of their Universal Payments Platform in net new bookings growth for 2013 in this week’s Q2 report. The New York Times looks at Lending Club, Prosper, Zopa, On Deck, SocietyOne, and Kabbage as significant lending platforms. Finextra reports: PayPal trials new geolocation payment service in London. Leadfusion launches new RESPONSE interface for Premium Financial Tools. Finect Founder Jennifer Openshaw moderates Best Practices in Compliant Social Media webinar. 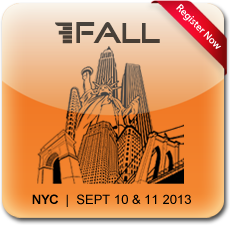 See Finect demo at FinovateFall 2013 in New York. FinovateFall 2013 is right around the corner. That means it’s time to start getting to know the entrepreneurs and innovators that will be presenting their technologies on stage in New York City in September. Remember, the early bird deadline is this Friday, August 2nd. So to reserve your spot and register now. Akimbo Financial offers a social bank account alternative that makes sharing money easier than ever. authenticID‘s identity tools pictureID and catfishID, are the most accurate, time-saving solutions for the forms of ID we already carry. Backbase‘s Launchpad, the Commercial Banking Edition, making CFO’s work easier. BehavioSec uses behavioral analytics to transparently tackle web and mobile security. BillFloat revolutionizes credit delivery to consumers and businesses. Biometric Signature ID has a patented software-only biometric for secure ID online verification. BizEquity is the first and leading cloud-based business valuation engine, an innovative solution to small business lead generation. Capital Access Network is the largest and most experienced small business finance specialist. Cardlytics uses consumer purchase data to drive a patented advertising platform. Ads are so relevant–they’re expected. CoverHound is a comparison insurance adviser, helping people discover, buy, and manage insurance online. CR2 is the innovative provider of self-service banking solutions including ATM, Internet, and mobile banking. DoubleBeam‘s SDK powers mPayments inside other mobile apps, helping signup customers quickly and save a ton on the cost of payments. FinanceIt offers businesses the ability to provide consumer financing to their customers at the POS. Financial Guard helps you protect your investments, providing online investment advice at the right price, finally. Finect is the leading online network for the financial services industry. Fiserv is a leading global technology provider serving the financial services industry, driving innovation in payments. FlexScore “gamifies” financial planning, gives a “score” of your financial fitness, and provides education, advice, peer comparisons. Float Money offers interest-free credit to members of its shopping club and financial health partners. FutureAdvisor manages your investments for better returns, making quality financial advice available to everyone. GMC Software Technology is a leading software developer of solutions that transform the customer experience. Guide Financial is like a healthcheck for your finances – automatically scanning your accounts for ways you can earn or save more, and providing simple, easy fixes. Ignite Sales is the leader in retail banking, customer acquisition, and retention technology. Innovation Agency, where you can execute on your innovation mandate and unlock the wealth of ideas in your ecosystems. Interactions provides natural language Virtual Assistant application services for the automation customer care processes. Jumio is a next generation credentials management company offering payments and ID scanning and validation products for mobile and web transactions. Kofax is a leading provider of smart process applications that simplify the business critical First Mile of information-intensive customer interactions. LearnVest empowers people everywhere to take control of their money and live their richest lives. Level Money is a financial GPS, designed to replace budgeting. Lighter Capital provides growth capital to technology companies in a highly-automated basis – Capital-as-a-Service. Lumesis provides software for the fixed income municipal market. Compliance and credit-focused. Luminous is a boutique innovation company that has become synonymous with innovative banking around the world. Manilla is the leading free and secure service to simplify and organize daily financial life. MasterCard is a technology company in the global payments industry, operating the world’s fastest payments processing network. mBank is the biggest, pure-play online bank and the third largest retail bank in Poland. miiCard is the first digital identity verification service to prove ‘you are who you say you are’ entirely online. Mitek is positioned as the leading innovator in mobile imaging software. MoneyDesktop empowers financial institutions to provide online/mobile banking experiences to promote personal financial intelligence. Motif Investing is a thematic, customizable, low-cost and crowdsourceable ETF-like product that is disrupting investing economics. Narrative Science enables companies to uncover the insight hidden in their data and create new content at a scale and frequency never before possible. Numbrs – One App – Every Bank. P2P Cash is the mobile wallet with switch technology that allows us to aggregate all other mWallets and mobile financial services. PayWith is powered by MasterCard. Funded by Merchants. Loved by Consumers. PhonyInvoices provides invoice fraud detection and prevention. We check a company’s vendor lists and transactions for suspicious activity. Place2Give provides valuable and trustworthy information to make the most impactful social capital investment decisions. QuarterSpot lending platform delivers the lowest cost and most favorable term small business loans. RevolutionCredit is a revolutionary solution that transforms the credit decisioning process for both creditors and consumers. SaaS Markets is the enterprise app store company for financial organizations looking to leverage cloud-based applications for their employees or customers. SavedPlus is an automatic savings program that helps customers save money with every purchase. Simple Verity provides business credit reports on any SMB in America. Socure offers a social identity verification solution to combat the growing risk of online identity fraud for financial institutions. SpearFysh leverages mobile, speech analytics, big data, and SaaS technology to improve sales processes and drive growth. Spreedly provides vault cards in the cloud and work with more than 50 payment gateways. StockSmart apps and platform offer insight and information on the world’s best companies and people. StrategyCorps delivers local/mobile/social consumer checking solutions so appealing and relevant, your customers will gladly pay for them. Tinkoff Credit Systems is Russia’s leading provider of online financial services. 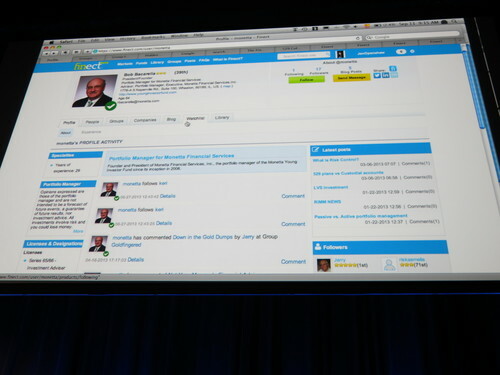 TipRanks is a cloud-based service that measures the performance of anyone giving investment advice. Toopher eliminates online fraud using your phone’s location. Simple, secure, your phone stays in your pocket. Unleash is the cloud CFO that helps small businesses make better decisions faster. VerifyValid and Deluxe are giving checks their first major upgrade in more than 200 years. Versafe protects all users from all malware, threat types. On all devices, all transparently. WordSentry software analyzes messages during composition, identifying non-compliant components, for correction before sending. Yodlee is the platform for financial innovation, powering the world’s largest collection of transactional data. Yseop creates a new age where financial services delivered to customers are driven by AI and human collaboration. Zenmonics is a global technology services and mobile product provider to the financial services market. Zighra empowers banks and financial institutions to leverage implicit mobile user authentication and accelerate payments. Zooz provides complete payment essentials at your fingertips: a robust set of tools that will improve the payment process. Plus more stealth companies to be announced in the weeks to come. To find out more about the upcoming FinovateFall 2013 event in New York, September 10 and 11, visit our FinovateFall information page here. Jilliene Helman, CEO and co-founder of Realty Mogul, talks crowdfunding and real estate in NAWRB’s N Magazine. Bazaarvoice CEO Stephen Collins writes about why Big Data needs big problems. Finect’s Jennifer Openshaw talks about social media and the coming deluge of hedge fund advertising. Total Payments features Moven founder, Brett King, as he discusses the future of banking and payments. Bank Innovation looks at Moven, Simple, GoBank, and the decline of personal checks. TechPost considers the success Lending Club, SocietyOne, and Zopa have had implementing P2P lending platforms. American Banker reports ID Analytics announces updated ID fraud software, ID Score.